a Cornish Hen aficionado. In the past it was always Poussins at $7.00 a pound. The Cornish Hen costs $2.39 a pound, and weighs about that, or only slightly more. What made it special was brushing on a Tamari Balsamic Glaze*, and roasting for a short while. That was all the little guy required to be tender, cooked through and extremely juicy. 2. In a small bowl whisk the EVOO & Tamari Balsamic Glaze until emulsified. Completely brush the Hen, with a good coating of the glaze. Place a rack onto a baking sheet, add the Hen & roast for about 25 minutes, or until an internal thermometer reads 130 degrees. Remove the Hen & allow it rest for at least 5 minutes before it’s cut in half. When the oven has cooled down, return the Hen to keep it warm while preparing the Sauce. White Wine & bring to a boil, constantly whisking to avoid an overflow. 2. Turn off the heat & vigorously whisk it to a smooth emulsion. 3. 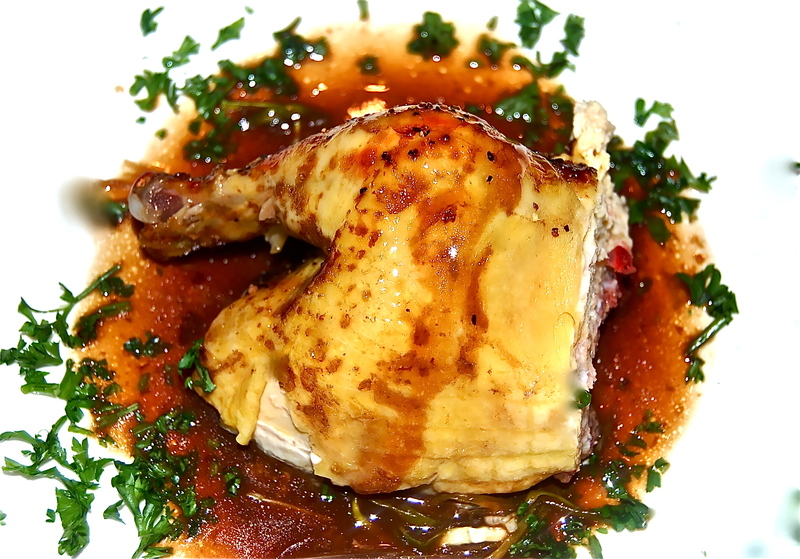 To serve, spoon the sauce onto two plates, top with half a Hen, a dribble of Sauce & a sprinkle of Parsley.